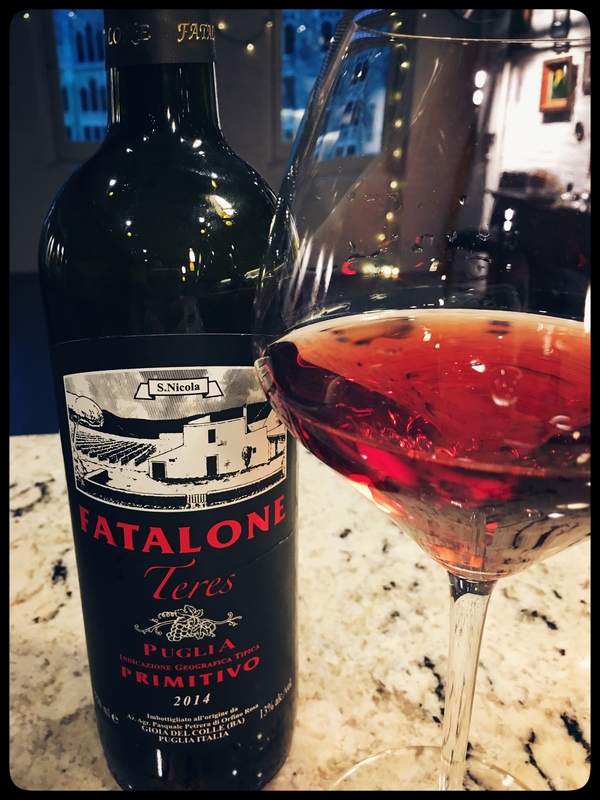 Estate: The estate was founded in the late 19th century by Nicola Petrera when he built his home and planted Primitivo vines in Gioia del Colle, a small town in the heart of Puglia, southern Italy. The name ‘Fatalone’ was born with Nicola’s son, Filippo, whose nickname was Il Fatalone [which translates to Lady Killer, or “one who can boast to be an irresistible seducer of women”]. Filippo had quite the Don Juan reputation; he lived to be 98 years old, “metaphorically speaking between Bacchus and Venus, having breakfast every morning till his last day with half a litre of Primitivo and half a litre of fresh milk”. The passion for Primitivo grapes has been handed down from father to son; today the estate is headed by the 5th generation, Filippo Petrera. The family has always practiced organic methods; in 2000 they became certified organic, followed by sustainable certification in 2007. Using solar power, their entire production from vineyard to cellar is 100% sustainable, and they have a carbon neutral rating. Music is played during ageing in the cellar, “a mix of classical music and sounds from nature to support the micro oxygenation and the activity of the living micro flora present in our natural wines”. Philosophy: We want our wine to proudly mirror the territory, the soil and the men who are its authors. Winemaking: Grapes are sourced from an 8 hectare vineyard planted in 1990. The vineyard is located on rocky hills 365 meters above sea level with soils that are a mix of clay, limestone, silica, thin layers of red earth and rocks that are rich in marine fossils. Grapes were fermented “in contact with the skins for 30 hours almost like for a rose wine”, using only naturally occurring yeasts. Aged for 12 months in stainless steel tanks, then for 3 months in the bottle. Tasting Notes: Sunset red in colour [I lifted this from the winemaker’s notes, as I think it’s the most accurate way to describe such a unique colour], with aromas of fresh berries and floral hints. Sweet red berry fruits are accented by a tingling acidity, finishing with clean minerals. Refreshing, unconventional and engaging, your glass will empty rather swiftly.